Posted on November 28, 2014 at 1:15 pm. Net Entertainment has officially released its first ever five jackpot online video slot, Cosmic Fortune, giving avid slots players even more major winnings to take home. Cosmic Fortune is a 5-reel, 3-row, 15-line online pokie with an intergalatic space theme focusing on the ever-alluring draw of journeying through the unknown corners of the universe. The game is available to play for free now in practice play or for real money at all major Internet casinos hosting Net Entertainment games, such as G’Day Casino. Cosmic Fortune features include two bonus games, a jackpot game, Free Falls, an Avalanche Feature and wild substitutions. Earning 3 Scatter symbols in the base game awards 10 Free Falls. Triggering the Free Falls Bonus Game allows for massive coin wins by collecting balls – the more you have, the more chances you get to hit the jackpot cups in the Jackpot bonus game. One of the five Jackpots can be secured if the target is hit three times. 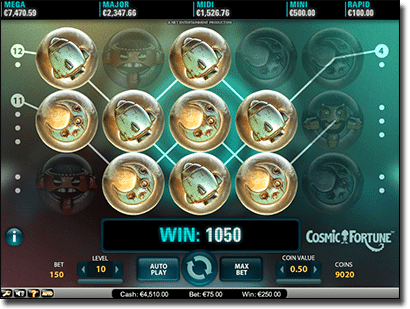 With a expressive and impressively animated poster character exuding a ton of charming personality and some awesome scatter and wilds artwork, Cosmic Fortune is definitely a standout in the crowded online slots arena. “Cosmic FortuneTM is an action-packed space journey that leaves players wanting more and more of this mysterious intergalactic trip,” Simon Hammon, Chief Product Officer of NetEnt, comments in the official press release. Play Cosmic Fortune for free or for real money in AUD at www.GDayCasino.com and take advantage of a generous unlimited match bonus on your deposits – and a free slab of VB if your first deposit is $100 or more.